(D) Yancey succeeded Brian Banks, who resigned following another felony conviction. (D) There are seven candidates, led by ex-Marine Joe Tate and community organizer Carla Tinsley-Smith. (D) Byrd has four challengers, none of whom have reported raising any money. 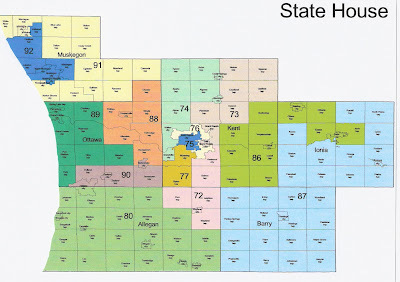 (D) An incredible 14 D candidates are running for this seat. There are five who have raised at least 10K. They are political staffer Rico Razo, community organizer Michelle Oberholtzer, community organizer Matt Friedrichs, political staffer Jeffrey Nolish, and Hamtramck City Councilman Saad Almasmari. (D) There are six candidates, led by radio broadcaster Cynthia Johnson and political staffer Mark Payne. 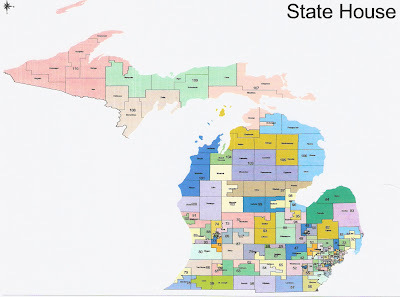 (D) This district has a strong claim to be the most diverse in Michigan, and has successively had black, Hispanic, Jewish, Muslim, and Chinese representatives. Ten Ds are running for this seat, including six who have raised over 20K. They are attorney Aghogbo Edevbie, political staffer Terra DeFoe, political staffer Tom Choske, political staffer Ricardo White, union organizer Charlesetta Wilson, and government employee Tyrone Carter. (D) Garrett has three challengers, none of whom have reported raising money. (D) After flirting with a run for congress, Gay-Dagnogo has four challengers, including Detroit city employee George Etheridge. (D) Community organizer Karen Whitsett, educator Donald Stuckey, and former WSU Board of Governors member and political staffer Gary Pollard are competing for this seat. (D) Love has three challengers, none of whom have reported raising any money. (D) Then 21-year-old Inkster city councilman Jewell Jones was nominated by party insiders after the 2016 primary following the sudden death of Rep. Julie Plawecki. In his first primary, he faces Garden City mayor Randy Walker. The race is reportedly very close. (D) Taylor councilman Alex Garza is the only one of four candidates to report significant fundraising. (D) Westland councilman Bill Johnson leads fundraising, followed by Sanders activist Mike McDermott and former Westland councilman Kevin Coleman. Republican Joseph Bellino pulled off a shocking upset against D Bill LaVoy in a district that swung heavily to Trump. Lavoy's wife Michelle is running this time. (R) Livonia city councilman Brian Meakin is unopposed for the R nomination. (D) Livonia school board member Dan Centers leads microbiologist Laurie Pohutsky in fundraising. R Jazmine Early and D Nate Shannon are both unopposed for their party nominations. (D) Pontiac School Board member Brenda Carter, businessman Chris Jackson, and pastor Keyon Payton are the only candidates (of six) to raise money. (D) Attorney Wisam Naoum is the only candidate raising money. (D) State senator Vincent Gregory is seeking a third and final state house term. He has actually been outraised by businesswoman Katie Reiter and attorney Kyra Bolden. Alex Meyers, Lisa Cece, and Michael Poole are also running. (R) (Lean Potchynok-Lund) Karen Potchynok-Lund, wife of conservative former rep Pete Lund (08-14), has the most establishment support and best fundraising. Scott Czasak, a staffer for rep Lucido (10-14), Shelby Township Trustee Douglas Wozniak, Frank Lams, and Tom Stanis are also running. (R) (Likely Crawford) Crawford, one of the more moderate R members of the state house, has repeatedly attracted challenges from the right. Chase Turner is challenging her this time. (D) Dentist Aditi Bagchi has led fundraising. Attorney and Novi city councilmember Kelly Breen and Joe Petrillo are also running. (R) (Lean Kosmatka) Assistant prosecutor Marsha Kosmatka, a mainstream conservative, has establishment support and a fundraising lead. Attorney and firearms instructor Ryan Berman, Michigan GOP official Kevin Tatulyan, and Phillip Hoyt are also seeking the R nomination. 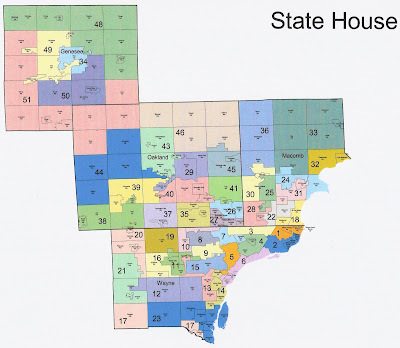 (R) (Tossup) Lawyer/businessman David Wolkinson, a conservative former state GOP official, finished a close second in the 2012 primary for this seat. CPA Paul Taros is a Tea Party activist who may not be the best fit for a moderate district. Michigan GOP youth chair Mike Banerian and businesswoman Malissa Bossardet have moderately conservative platforms. Joe Zane has establishment support but has made many democrat donations. Paul Secrest is a (former) democrat and openly liberal. (D) Former state department employee Mari Manoogian has a fundraising lead. Dietician and anti-gun activist Nicole Bedi, who held McCready to a 7% victory in 2016, is running again. (R) (Tossup) County commissioner, former Troy councilman and David Trott staffer Doug Tietz is a mainstream conservative. Troy councilman Ethan Baker has more support from moderates. The third candidate is Ronald Dwyer. (R) Brighton Township Trustee Ann Bollin is unopposed for the R nomination (don't tell Henry VIII!). (R) (Tossup) Independence Township Trustees Andrea Schroder and Jose Aliaga, who finished second and third in the 2014 primary, are running again. Waterford Township Trustee Anthony Bartolotta, who is more moderate, is also running. (R) (Lean Maddock) Businessman, Tea Party leader and Trump supporter Matt Maddock has given the local establishment fits with his frequent challenges to party officials and his narrow loss to incumbent state sen Mike Kowall in 2014. He has a big fundraising advantage and support from Right to Life. Businessman Matt Marko and Kowall staffer Lynn O'Brien are also competitive. April Guiles and Michael Mamut are also running. (D) Dr. Sheryl Kennedy has a big fundraising lead over two other candidates. (D) John Cherry, son of the former LG of the same name, leads fundraising. Former Flint Mayor Dayne Walling, who lost his reelection during the water crisis, is also running. Four other candidates have raised little. (R) (Lean Mueller) Police officer Mike Mueller has most establishment support. County commissioner Drew Shapiro has a history of run-ins with the police. Trump delegate Ian Shetron and attorney Matthew Anderton are also running. (D) State senator Rebekah Warren is running for a third and final state house term. She is overwhelmingly favored over Shauna McNally. (D) WMU teacher Alberta Griffin and game designer Thomas Whitener are roughly even in funding, with Corey Kendall also running. D Calhoun County Commissioner Jim Haadsma, who narrowly lost to Bizon in 2016, is running again. Dave Morgan, former Calhoun D chairman and state house candidate turned R Pennfield Township Supervisor, is the R nominee. (R) (Tossup) Maturen is one of the most moderate Rs in the legislature. He faces a self-funded challenged by MI GOP activist Matt Hall, an ardent Trump supporter who is more conservative. (R) (Lean Lightner) The candidates are Jackson county commissioner Sarah Lightner, former Leoni Township supervisor Todd Britain, Jackson county commissioner Carl Rice, and Matt Eyer. (R) (Likely Clark) Leon Clark is the only candidate who has raised money. (D) Ingham County commissioner Kara Hope is the only one of five candidates with significant fundraising. (D) Schor vacated this seat after his election as Mayor of Lansing. Former R state rep Paul DeWeese (98-02) has a fundraising lead. His main competitors are Ingham county commissioner Sarah Anthony and progressive activist Kelly Collison. There are four other candidates in the general election and two others in the special election. (D) Meridian Township Treasurer Julie Brixie led fundraising, followed by former county commissioner Penelope Tsernoglou and county commissioner Teri Banas. (R) (Lean Cascarilla) Businessman Chuck Cascarilla has led fundraising, followed by Eaton County commissioner Christine Barnes, teacher Chris Stewart, and Clarissa Trevino. (D) School board member Angela Witwer has a fundraising lead over educator Beth Bowen. (R) (Likely Johnson) Johnson, a libertarian conservative in the mold of Justin Amash, is being challenged from the left by Wayland Mayor pro tem Jennifer Antel. (R) (Lean Afendoulis) Lynn Afendoulis, cousin of the (moderate) incumbent has most establishment support. Businessman Ken Fortier has also fundraised well. Businessman Robert Regan, who finished second in 2014, is the most conservative and has some grassroots support. The final candidate is Cannon Township Trustee David Spencer. (R) Mark Huizenga, mayor of Walker, is unopposed for the R nomination. R Amanda Brand and D Rachel Hood are unopposed for their nominations. (R) (Safe Brann) Brann should have no trouble with Jordan Oesch. (D) Leftist activist Robert VanKirk is the only candidate raising money. (R) (Lean Mann) Niles city councilman David Mann has a fundraising lead and grassroots support. Teacher Brad Paquette, businesswoman Kelly Priede, Steve Bury, Dana Daniels, and Daniel Hinkle are also running. (R) (Lean Wendzel) Businesswoman Pauline Wendzel has a large fundraising lead. Also running are professional volunteer Maria Moen, black Republican activist Troy Rolling, technical writer Bruce Gorenflo, and JoAnn DeMuelenaere. (R) (Lean Nicholl) Eight R candidates are running, the most of any district in Michigan. Leading the pack is school administrator Kenneth Nicholl. Snyder staffer Eric Stocker and firearms instructor Gary Eisen, who finished second in 2012, are also competitive. Rounding out the field are John Mahaney, Michael Pratt, Dan Tollis, Dan Turke, and Joel Willaims. (R) (Tossup) Canfield is retiring after two terms for personal reasons. There doesn't seem to be a clear distinction between county commissioner Matthew Bierlein, Phil Green, son of conservative state senator (10-18) Mike Green, and businessman Dean Smith. (R) (Lean Meerman) Farmer Luke Meerman is the favorite, with plenty of establishment and conservative support. Michael Bosch, Brent Huddleston, and Georgetown Township Trustee Jason Minier are also running. (R) (Safe Lilly) Lilly shouldn't have trouble defeating retiree Beverly Zimmerman. (R) (Likely Slagh) Ottawa County Treasurer Bradley Slagh has all the establishment support over Orlando Estrada. (R) (Likely VanWoerkom) Congressional staffer Greg VanWoerkom, son of state senator (02-10) Jerry VanWoerkom, faces former county commissioner Alan Jager, who is running somewhat further right. (D) Whitehall city council member Tanya Cabala is the only candidate raising money. (R) (Tossup) Assistant AG Graham Filler has led fundraising, followed by Snyder administration official Madhu Anderson and county commissioner Anne Hill, who is the most conservative. All three seem to have a good chance to win. (R) (Lean Gerhardt) Saginaw Township Treasurer Steven Gerhardt has more conservative support against moderate funeral home owner Rodney Wakeman. Rick Riebschleger is also running. (R) (Safe Glenn) Annette Glenn, wife of the incumbent, faces Carl Hamann, who is not raising money. (D) Mount Pleasant Mayor Allison Quast-Lents faces attorney Kristen Brown and Randall Doyle. (R) (Likely O'Malley) Radio host Jack O'Malley has most establishment support against Carolyn Cater, who is running somewhat to his right. (D) Nurse Kathy Wiejaczka seems to be favored over Edward Hoogterp. (R) (Lean Hoitenga) Hoitenga has been one of the most conservative members of the house since her election in 2016. She is being challenged from the left by former Cadillac Mayor William Barnett. (D) Attorney Lora Greene is the only candidate raising money. (R) (Safe Chatfield) Chatfield is the presumptive choice to be Republican leader next term. He faces a gadfly primary challenge from Bruce Newville. (D) Farmer Joanne Galloway is the only candidate raising money. (D) Cambensey, who lost a primary challenge to John Kivela in 2016, won a special election to replace Kivela after his suicide. (R) (Likely Schott) Dr. Kirk Schott is the strongest candidate in a very weak field (others are Keith LaCosse, Gregory Markkanen, and Brady Tervo). Republicans seem likely to punt this Trump-won seat due to weak recruitment.